An asphalt base sealer that provides a protective seal for pruning cuts. 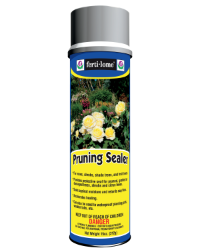 Spray ends of pruned branches and limbs thoroughly to provide a tough, rapid drying coating over pruned areas. Fast & Easy to use. To prevent stopping up of spray nozzle during storage, the can should be inverted and sprayed for a few seconds after use.